Phew… It's been a crazy couple of weeks!! I just published Barefoot Kisses (which went as high as #35 in the Kindle Store!) and now Kisses From Jack is currently on its free run (ending 8/15/14). That's a lot of book to put out. 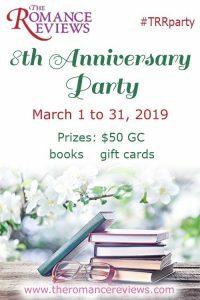 And promo. And anxiously watch the reviews pile in. And then promo some more. Whew. My son is nearly 2.5 years old (holy crap did time fly!) and he has some sensory issues. Most nights, he goes to bed in his Elmo bed, but around 2am he creeps into bed with me and snuggles until morning. The only downside is that he wants to be the center line in the letter H. We have a queen bed and he's over 3 feet tall. It gets cozy real quick. I read about these weighted blankets giving a hugging sensation to kids through the night, and it immediately sounded like something my son could use. So I went online to go buy him one only to find they were all priced in the $200 range. For a plain blue, boring blanket. I like to quilt, so I decided to make my own. 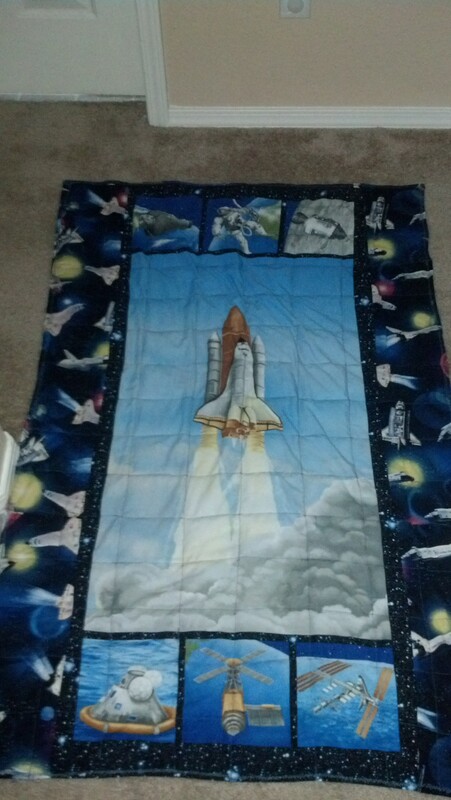 For my blanket, I found two space wall hangings (from fabric.com) measuring 24×57 and then got a yard of the space shuttle fabric for the sides. (Each shuttle side is 7 in wide) For the weight, I found those plastic “bead” looking things that go in flower arrangements. (Not the water absorption kind, but the ones that look like bead rejects). 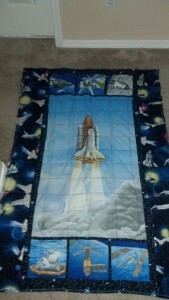 The blankets are supposed to weigh between 10-20% of the child's body weight. My string bean child weighs right around 30lbs, so I used 5lbs of beads. I sat down and spent a whole day doing nothing but sewing, filling, and sewing. It was fabulous 😀 $30 in fabric+ $15 in “beads”+ thread and some time= awesome blanket. It is nice and heavy. I like laying under it! Tonight will be the first test to see if he will stay all night in his own bed without needing Momma snuggles in the middle of the night. 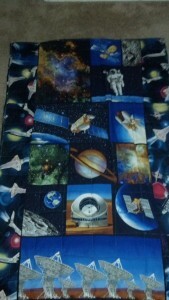 Here's hoping space blanket does the trick! « Barefoot Kisses: A billionaire love story is now available!